Strickland's Stratford Toyota - Canada's First LEED Gold certified dealership. Toyota Motor Corporation has a long history of concern for the environment, and actively seeks ways to meet the growing transportation needs of society in ways that are less harmful to our planet as a whole. 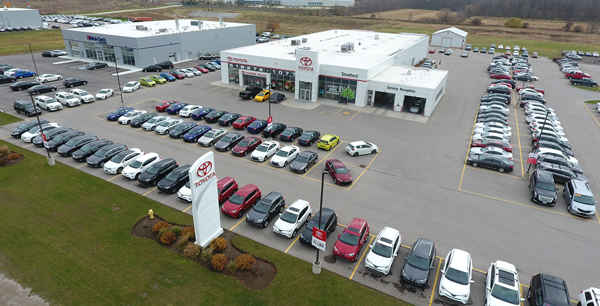 As one of the newest dealers in the Toyota Canada network, Stratford Toyota strived to align itself with the core environmental values of Toyota. We have done this by building a facility that was constructed to L.E.E.D. standards. The Leadership in Energy and Environmental Design (LEED) rating system measures the environmental impact, sustainability and efficiency of buildings. 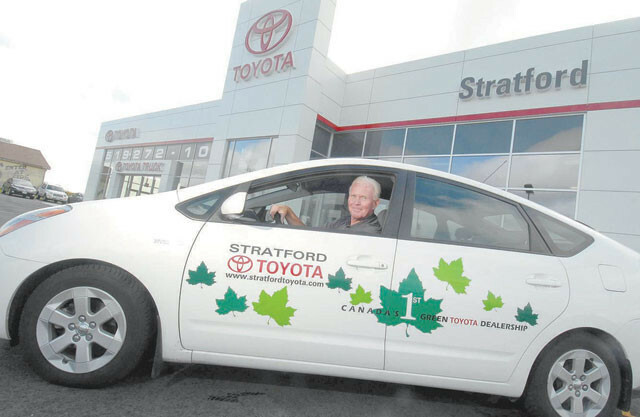 On June 7th, 2010 Stratford Toyota officially became Toyota Canada's first LEED certified dealership. Not only were we LEED certified, we were able to obtain a Gold certification level, becoming the only automotive dealership in Canada to have such a distinction. Our building operates on between 35-40% less energy than a normal building of comparable size. Over 97% of construction waste materials were recycled. 58.75% of building materials were sourced locally to reduce transportation emissions. 73.32% of all wood used in the construction of the dealership was sourced from sustainable forests (certified by the Forest Stewardship Council). An 8000L storm water cistern is used to reduce the use of potable water by 99.02%. Over-all water reduction of 84.41% achieved compared to similar sized facility. High efficiency lighting is used through out the dealership which is controlled by room occupancy and an electronic lunar calendar to control day/night lighting. 10 sky lights are used in the service area to reduce the need for artificial lighting. In-floor radiant heating is used throughout the dealership to reduce energy costs. A white thermoplastic polyolefin (TPO) roof is used to repel sun rays to reduce heat transfer in the summer months. Indoor Air Quality Management Program cycles indoor and outdoor air, instead of recycling air over and over again. We are very proud of the results of this project. It was an education for all that were involved from start to finish. As much as we have learned, it is very important to us to educate the public on what can be achieved using green technologies. To help with this initiative Stratford Toyota has built an interactive Green Education Kiosk in our showroom. We are also a proud partner of the Toyota Evergreen Program which rewards schools for the implementation and completion of green projects. To date we have rewarded five Stratford area schools with grants for projects they have competed, and look forward to working with many more in the future. For more information about LEED and their initiatives please visit www.cagbc.org and for more information about Stratford Toyota just stop by for a visit or send us an email. Many thanks to Hyde Construction, NA Engineering Associates Inc, Fluent Engineering Inc, Hyde Electric and Dordan Mechanical for all their help and hard work to make this project such a success. We practice full disclosure with all of our used vehicles. We thoroughly research every vehicle that passes through our doors to make sure that they meet or exceed our stringent standards. You will have access to any and all information that we can gather on any one of our cars before you choose to purchase. Family owned and operated business. Servicing Ontario for over 30 years. We had an excellent experience at Strickland’s today. Thanks for the help Josh, you were great! Conrad help us with the purchase of our 2018 Equinox. He was helpful and very professional. Appreciated that he wasn't a pushy salesman and let us take our time making a decision. Very friendly staff, felt welcomed right when walked in the door. Very happy with the service and the vehicle ! The sales rep. was knowledgeable and wonderful to deal with. I would recommend Strickland's to anyone and would go back for my next vehicle. Awesome experience! Quick and stress free, friendly staff. Overall great experience buying a car with Strickland’s!